TOTAL FLANKER...a rugby blog: The Last Post? This may turn out to be my last post on this blog. It appears that my regular criticism of what goes on in the corridors of power at Twickenham has finally caught the attention of someone important. - publishing libellous comments about employees and other representatives of the RFU. The letter demanded that I cease and desist from making derogatory comments in relation to the RFU, that I publish a full retraction of all such comments and that I give an undertaking not to make such comments in the future. I can tell you now that I am not prepared to publish any such retraction nor give any such undertaking. However, given that the letter makes it clear that I may be subject to injunctive relief and damages and being in no position financially to fight an expensive legal battle, I may have no option but to cease blogging altogether. If this is the case may I say a big thank you for your support and forbearance over the past 4 years and 11 months - please know that it has been very much appreciated. So this might be it. It might be goodbye. It’s been emotional. I suppose it was always going to happen, although I never dreamed it would. It seems that governing rugby bodies, particularly this one, can't accept criticism. 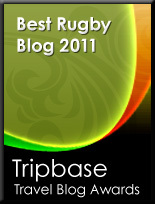 Thanks Total Flanker, for everything you've done, its been great reading your blog..
Ps. is this an April fools prank? There had better be an "April Fools" punchline to this. If not, fight the power - I will be the first to admit that a barrister I am not, but nothing you have said here about public figures crosses the line into libel. Sarcasm and commentary, even negative, are protected speech on my side of the pond. Linking to published images is not certainly not punishable. Hehe, Im staring to regret being the only one who commented without mentioning a possible April Fools prank. I'm glad it was only the April Fools post. We love your criticism.